UPDATED: Originally, Foursquare was designed with the goal of “making cities easier to use.” But along the way, it became synonymous with check-ins and the game mechanics behind it. That was a good thing when it was new, unique and fun. But the world has moved on, and so have location competitors, who are looking beyond simple games to expanded deals, bigger competition and recommendations of places. Foursquare is now taking a big leap ahead in its story with version 3.0 as it matures into a much more complete and polished location-based service capable of tackling its original vision. Founder and CEO Dennis Crowley said in a blog post that the service is now closing in on 7.5 million users after adding about 7 million since last year’s annual South By Southwest event. Users checked in almost half a billion times in the last year. That’s a lot of check-ins, but Crowley rightly understands that the check-in is just a starting place. Now with Foursquare 3.0, available tonight on iPhone (s aapl) and Android (s goog), the company has made strides on a number of fronts that should keep it at the front of the location pack. Discovery. Foursquare has been talking about offering recommendation services, just like many competitors, and now with a new Explore tab, users can get suggestions on where to go. The recommendations factor in a bunch of signals, from the places a user and their friends visit and favorite, to the categories and types of places they frequent. Interestingly, Foursquare said it will also tailor suggestions based on the day of the week or time of day. Crowley said the recommendation engine will shine with both basic and quirky inquiries. This is likely why the company was casting about for a data scientist a little while back: so it could build a recommendation engine that made use of all of its data. The Explore feature brings Foursquare up to par with many competitors, though as we’re learning, there are many ways to do recommendations. The Explore feature also puts more emphasis on the check-in, because it helps provide Foursquare with more data to build its recommendations. Rewards. Foursquare was out early with its game mechanics, but the system has become stale for some time. Now, Foursquare is revamping its leaderboard, awarding points for a wider range of activities. Users can get points for trying a new type of restaurant, visiting a new place, traveling to new cities, getting friends together and many other actions. The leaderboard is now limited to the last seven days. This again re-emphasizes check-ins, because the system rewards a lot of different activities. And the week-long time frame encourages people to keep trying out new things and remaining active. There are still mayorships, which are increasingly hard to get. But with a revamped leaderboard, users have more ways to compete and get recognized for their efforts. Loyalty. Keeping users engaged is paramount for a service like Foursquare, which can burn through new users if it doesn’t give them a reason to stick around. Now the site is expanding its specials deals for mayors to more sets of people, enabling merchants to engage with customers in a lot more ways. Merchants can now extend specials to swarms, groups of friends, regular visitors, new customers, mayors or to everyone. This is an important element, because it gives people some tangible benefits of participating. Points and mayorships only work for more motivated users, but deals are always attractive. Foursquare got out early in the location game, but in many ways, it was in need of improvements befitting its status. Crowley said many upgrades didn’t take place as fast as he’d like, because the company had to deal with a lot of internal growth as it increased its headcount to about 40 people. 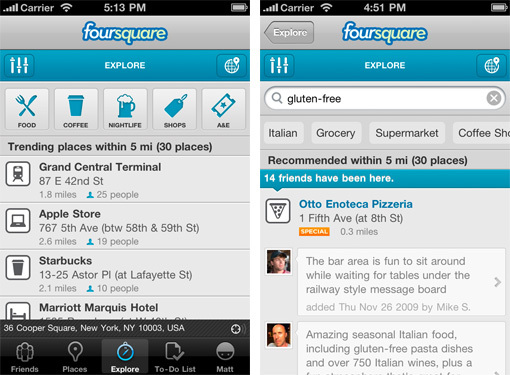 Now, finally, Foursquare’s larger vision is starting to take shape, and it’s a good thing. The company is showing no signs of slowing growth, but the name of the game is engagement, not just downloads. I have no insight into Foursquare’s churn, but it’s a definite concern for any app with a large following like this. Now with some key improvements, Foursquare has a chance to keep those users engaged and grow into something more useful than a real-world game. UPDATE: Foursquare has provided more information about its updated specials program, which now allows merchants to instantly set up special deals at multiple locations for users and get additional insight into user engagement through a new dashboard. Early partners include Sports Authority, Applebee’s, Radio Shack, Barnes & Noble, Chili’s, Whole Foods, Toys R Us and others.